The History Blog » Blog Archive » Khaled al-Asaad. Archaeologist. Hero. I haven’t posted about the nightmare of IS’ systematic destruction and looting for profit of antiquities in territories under their control because it’s so horrifying I can barely stand to read the headlines, never mind do the additional research necessary for a post. Every new outrage is covered in excruciating detail by press outlets everywhere anyway, so I thought this blog might provide a little respite from the onslaught instead of adding to it. Today’s news requires that I make an exception. 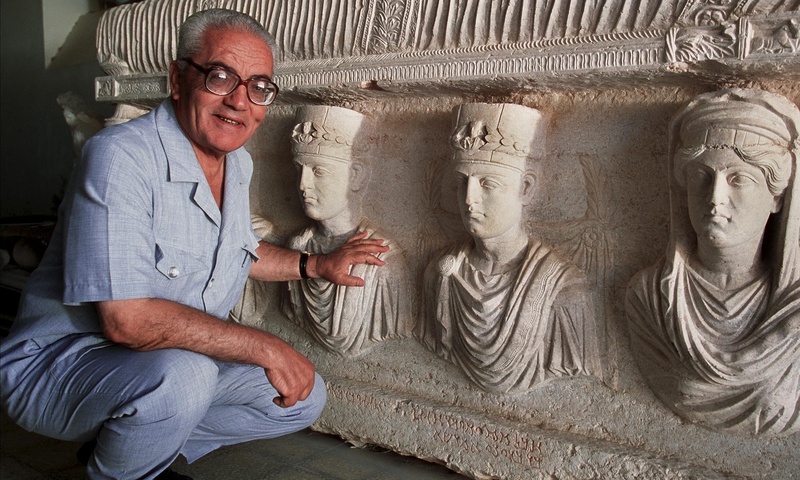 Khaled al-Asaad, archaeologist, author and longtime director of antiquities and museums in Palmyra, Syria, was murdered by Islamic State fanatics yesterday. He was 82 years old. He was beheaded in front of an assembled crowd near the ancient ruins he spent his life studying and protecting. His body was then reportedly strung up on one of the Roman columns in Palmyra that he had helped restore with a placard listing his “crimes,” namely apostasy, loyalty to and regular communication with the government of Syrian president Bashar al-Assad, representing Syria at conferences with “infidels” and being the director of Palmyra’s collection of “idols.” There are photographs that purport to be of his bloodied, decapitated body in other locations around the city as well. While IS militants like to film themselves destroying archaeological sites and artifacts for propaganda purposes, the vast majority of their offenses against history are the same as any other criminal organization’s: the looting and sale of antiquities on the black market. They’ll sledgehammer a few statues in a museum on camera to make it look like they’re principled religious fanatics bringing down idols, but filthy lucre wins over so-called principles any day. Asaad was involved in the transfer of the museum’s portable antiquities — the artifacts IS likes to steal to fund their wars — to comparative safety in Damascus. Before his death, he was held by militants who had heard some absurd rumor that ancient gold artifacts had been buried in the ruins instead of being shipped out with everything else. They interrogated him for over a month, by what atrocious means we do not know, but he refused to speak. The Guardian also has a lovely article written by Jonathan Tubb, Assistant Keeper of the British Museum’s Middle East Department and a good friend of Asaad’s that testifies to his warmth, generosity and passion for the history of his native city. When I was a kid, the notion of the archaeologist hero was defined by Indiana Jones, the swashbuckling adventurer saving treasures from Nazis and heart-extracting cult leaders. But Indiana Jones is fiction and if he weren’t he’d be a looter. A man who spends half a century dedicated to the study of his beautiful city’s rich history, excavating its ancient glories and sharing them with the world in museums and books; a man who, when the storm of violence approaches, works assiduously to hide those priceless artifacts from the monsters who would destroy them or disperse them into the hands of greedy, amoral collectors around the world; a man who then refuses to leave the city even though he knows he will almost certainly be a target of said monsters; a man who, at 82 years of age, sustains a month of God knows what kind of interrogation methods without breaking; a man who gives his life for love of history. That man is the hero. This entry was posted on Wednesday, August 19th, 2015 at 2:21 PM	and is filed under Ancient, Ex Cathedra, Looting, Modern(ish). You can follow any responses to this entry through the RSS 2.0 feed. You can skip to the end and leave a response. Pinging is currently not allowed. We need to assign this cult to oblivion soon. Thank you, Livius. I wasn’t aware of this. A crime against everyone who cares about history and beauty. It’s so easy to go on with our lives as if things like this didn’t touch us. It does, both indirectly and directly. I’ve seen Khaled al-Asaad being interviewed, and his dedication and warmth made his passion accessible. What he did was important to our understanding of the history of human culture. And that includes all of us. Atrocities have been going on for centuries, but what baffles me about the things happening now is that even the people involved are making no attempt to justify what they do. It is just what they do, for the sake of doing that which should not be done. There is no way to “obliterate” them, because the motivation recreates itself by appealing to new recruits. We have to find a way to reach those recruits first and show them a better way. Only those who love history, art, their country and respect all mankind, can grasp how wrong all of this is. These criminal-soldiers not only takes a hammer to magnificent, historic stone but a sharp blade to the body of a gifted scholar and tries to present him as evil. They not only fail to convince the world, watching their deeds, they show themselves for what they are – ignorant, selfish and evil. How sad when the we -worldwide – need goodness instead of cruel ways. I am so sorry to hear this. He truly was a hero. Frankly – we’ve passed the point of being able to peacefully resolve this. It’s a civilizational issue, much akin to the threat posed by the Nazis. We need to make it so costly for those who will not or cannot be reached that they decide not, at a very minimum, to contest our civilization in our space. In a word, we need to act now to obliterate their motivation to engage in such acts of atrocity. The West as a whole, acting for civilization, needs to act now or very soon. The juxtaposition of this post with the one about the neolithic massacre is, sadly, all too revealing. Beautifully written piece. A hero indeed. What can be said about the slaughter of an innocent and honorable man? He is with his God in paradise. These who have betrayed themselves will find at their end what they have actually “earned” with this abomination. This man’s loss wounds us all. Every man’s murder lessens me. Let him be remembered long after IS is a footnote in the history books. I don’t know how to go about such things, but at the least I would like to see a living reminder – the Khaled al-Asaad scholarship in Near Eastern History. Also I would ask that every one communicate with their Governments. We can’t ask our Nations to go to war, but we can ask that the fines and punishments for those profiting from this evil, those who buy and trade in illegal antiquities, should become ASTRONOMICALLY high. Permanently crippling anyone who would allow themselves to help these people who have chosen to be rabid animals instead of men. Our interest and specialty is History and Archeology. Let’s do what we can to fight back. Our lawmakers probably couldn’t find Syria on a map if you paid them. The only thing that they pay attention to is the threat to their positions. Make noise people. Let them know that standing by while this monstrosity is allowed to continue is unacceptable. We have words and we know what we are losing. We can act in our sphere. Let us do so! C A, consider your motion for a Khalad al Asaad scholarship seconded. Though, since he seemed to be a hands-on type, perhaps it should be more along the lines of a grant for projects dedicated to the excavation, preservation, and study of Syrian historical artifacts. I’ll go looking into what it would take. How would you propose it be awarded, on a continuing basis? I hope that al Asaad’s soul is now in a place where he is able to discover the answers to the questions he still had from his studies in life. And I hope that by his example, he has planted seeds of doubt in the minds and hearts of those who felt themselves justified to do as they did to him. And may the collections and sites for which he died stand preserved, in his memory. Perhaps a sample letter to write to lawmakers is in order? livius will surely post it. Even Congresspeople who don’t care much about history or art care about defunding IS, so that needs to be a big point. None of the looting will end until people stop buying antiquities. One can make it so completely expensive to do that it will become unpalatable and unprofitable. It won’t stop them all, but we can make it cost them everything financially. I’m an American, so today I called both of my Congresspersons, both Senators, and the White House. I asked that the fines for buying illegal antiquities that fund Terrorism become comensurate with the fines for money trafficking that funds Terrorism. I have never been greatly political. I can barely get my head out of the Sixteenth Century long enough to do more than remember to vote. Today I made noise in a good man’s name and I want to continue making noise. As for the Scholarship, I don’t know what terms should be set. Or where. I just think that this man deserves a living legacy. This seemed the best way to honor his virtues and values. I tried to contact the largest local University to try to get an idea of where to go from here but they put me on hold forever. I thought we might try an initial funding on Crowdfunder or something like that. I would be grateful for any suggestions and direction that I can get from my fellows as I have no clue from here. Thank you for taking this suggestion as seriously as you have. Good on you, C A. I get so dispirited about politics that I can barely read the coverage, never mind get involved, but you inspired me to call my legislators as well. I love the scholarship idea so much. This story has made huge news all over the world — flags at all the museums in Italy flew at half-mast today in Asaad’s honor — and if we strike while the iron is hot, this could really happen. I have no idea about the practicalities of the matter either, but I know someone who might. Time to make another call. Thank you for this – he gave so much, right up to the end. Superlative, CA, well done. I am following in your footsteps. C A, regarding the scholarship/grant effort, I’ve been looking around at places that could be custodians or managers of the grants, since I’m not certain we would have enough backing to start a foundation just for the administration/backing of such a grant. While many universities have ties to Syrian archaeology, anthropology, and history, it looks like the grants they support tend to go to their own students and professors, or their students’ and professors’ contacts, more often than not. Since we want (I think I’m hearing) this to be a wider-scoped scholarship/grant, I propose establishing it through the Archaeological Institute of America. They already have established grants, scholarships, and fellowships, and have contact information for the person who handles such things openly available on their website. Unless you or someone else has strong objections to this plan, I intend to contact their grants department no later than Tuesday, to inquire as to procedures and general standards for setting something like this grant/scholarship up. Contacting the AIA is an excellent idea, SourceRunner. Please let me know what they say. May I suggest, if this is the chosen manner to remember this man and his work, that the title of the effort be: ‘The Khaled al-Assad International Memorial Scholarship / Grant.’ This would denote the contributors were from all over the globe; it would also denote the effort was established after his death. The fact this brave and brilliant man was so devoted, he would not leave his community, defended these antiquities and his life was taken, this part of the saga must never be allowed to fade. Yes please! Thank you for your hard work! Beautifully written tribute. My heart continues to break. Queen Zenobia must be spinning in her grave. My heart goes out to the family of Dr. Khaled al-Asaad, from Hong Kong. I hope, if his family members happen to read through the messages, you would know people do care and support you, we are very sorry for your loss, which is also a loss to our world. No words can describe how intense my emotions were as I read through the news. I then find myself silly as I sometimes hesitated to fight for my passion, but now… Dr. al-Asaad has even died for his passion and also for human civilization – for the good of the world. He once again enlightens the world. Dr. al-Asaad is a beautiful and courageous soul, an inspiration. Livius Drusus, Audrey Burtrum-Stanley, and C A, I’ve contacted Jennifer Klahn in the grants and felloswhips department at the AIA (sent the e-mail this morning, after checking for any egregious errors I may have made last night) in the hopes that she can provide us some guidance. If for some reason the AIA turns out to not be our means for establishing this grant/scholarship, does anyone else know of somewhere else that might be suitable? I understand that the Smithsonian and the various national museums in European countries are sometimes resistant to this sort of thing, so would be hesitant to approach them. They’d be highly pleased to work with us on this. They’ve streamlined the grant creation process because they have done this a lot. They’re also delighted that we would like to create a positive memorial for Al-Asaad. –Their board would administer the grant per our endowment language (purpose, requirements, amount, frequency, etc.) and maintain contact with grantees to ensure that requirements get fulfilled. –They would take care of announcing and advertising the grant, and of custody/growth of the capital. –Funds: To establish a self-perpetuating grant of $2000 awarded yearly, we would need to raise $50K, or awarded every two years would need $25K. –Purpose of the Grant: My answer is “To enable the excavation, study, interpretation, stabilization, and/or preservation of the physical remnants of the ancient cultures of the area presently known as Syria.” What would your answer be? –Requirements: Many of the grants the AIA administers require their grantees to write and present a paper at the winter conference upon conclusion of the work facilitated by the grant. This sounds like an excellent requirement to me, though papers don’t necessarily come out of stabilization and preservation projects, so I’m inquiring as to what can be reasonably required as products from those. Any ideas on requirements? –Applicant Standards: AIA requires applicants to be members, so I’m asking how that limits the qualified pool. From what I gather here, it seems like we would want this grant to be open to national and international applicants, foundations, undergraduate students (supervised by a PhD), graduate students, holders of Masters’ degrees, and PhDs. Would we like to include anyone else? –Award Name, Amount, and Frequency: Audrey’s idea sounds nice, “The Khalid Al-Asaad International Memorial Grant” (checking how he preferred his name to be Anglicized in his papers, of course). Any other name ideas? And I do think that it should be awarded at least every two years, and be no less than $2000. Anything less would be so stingy as to be insultingly unhelpful. How go investigations on the fundraising front? Is crowd funding still looking like our best option? Or shall I ask about any contacts that AIA can recommend to discuss fundraising? “The International Khalid Al-Asaad Memorial Grant.” (My fault – but we are NOT Memoralizing the ‘International’ effort, we are Memoralizing the man & his work – hence, swap places of the wording. ‘International’ goes first, as I am in hopes there will be funds donated from around the globe (not just the US) by those devoted to the cause. I hope this fund is not just for youths as occasionally long established scholars run low on finances to continue / finish their projects. Also, we need to establish if this grant is available to the same person more than once. To have the best chance at getting International news coverage and wide publicity, we need to get this established and announced ASAP. Just yesterday was an article in the English paper, THE DAILY MAIL on Khalid Al-Asaad, but the ‘fresh, news-worthiness’ will fade soon. (What a sad but true reality.) If they continue to destroy the historic sites, that would sadly continue interest. Hmm. Good point about swapping the word order around. As for getting this “established and announced ASAP,” I would like to point out that to establish it, we need to raise the funds first. I put out what we’d expect to have to fund raise for a minimum in the rather long post above your post. However, we should probably move our coordination off of Livius Drusus’ weblog. Perhaps I should make a specific G-Mail address for this so we don’t have to reveal our contact info publicly. Hmm. Let me know what the gmail is. I’m trying to find a Crowdfunder that won’t take 20% of the raised funds. I like AIA, but it is insular to the USA. Are there any more similar organizations that are more world wide? Did the memorial grant idea worked out? Belatedly, I will pray for Khalid Al-Assad today.